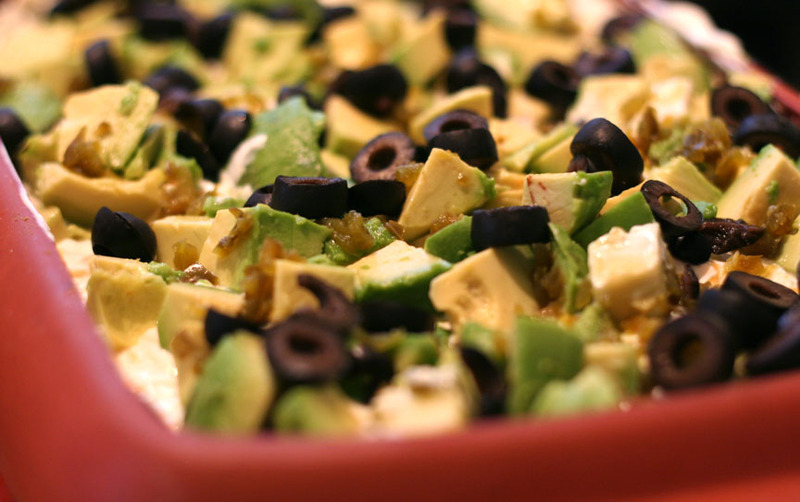 It’s similar to the classic 7-layer Mexican dip, but a bit different, a bit healthier…and it’s always nice to mix it up! Combine refried beans, black beans, scallions, salsa, cumin, chili powder and jalapeÃ±os in a medium bowl. Transfer to a shallow 2-quart microwave-safe dish; sprinkle with cheese. Microwave on High until the cheese is melted and the beans are hot, 3 to 5 minutes. Nice recipe! I like the romaine lettuce touch. I love using the 75% reduced fat cheddar cheese found at Trader Joes, and there’s also a nonfat sour cream (the container looks like a cow). Here’s to mixin’ it up! I love cumin- sounds like a great twist on this recipe! I can’t wait to try it out. I have yet to go wrong with an Eating Well recipe. Definitely going to try this one! Use home made refried beans…they are SOOO much better for you and are easy to make in the crockpot. I bet I’d love that dip. So many avocados!